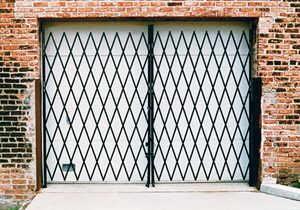 Folding Gates, Security Gates | ACE Industrial Equipment, Inc.
Folding gates or security gates can help prevent intrusion by unauthorized personnel, and to keep the more expensive, or sensitive items secure. Folding gates are great for closing off bay doors, and makes it more difficult for theft to occur. Folding gates can also eliminate the need for costly security guards. Made from cold rolled steel, our folding gates are of sturdy construction, and roll easily on ball bearing castors on the leading edge of the gate. Features include a locking bar on single gates and a padlock attachment on double gates. Our folding gates install easily with all of the brackets furnished. Custom orders are welcome, or you can choose to select one of our stock folding gates. For more information on our folding security gates call us today.